Edits: Dean C. (Steve Murphy)/Scott F.
At Yosemite National Park in Northern California, Raph, Ninjara and Naga have decided to take a relaxing camping trip (at Splinter’s behest). Naga wonders if they’re going to see any action out in the wild, but Raph reminds the kid that they promised Master Splinter that they’d take it easy and not get into any trouble. Ninjara is fine with that order, as she thinks the scenery is so romantic it would be the perfect place for a honeymoon. 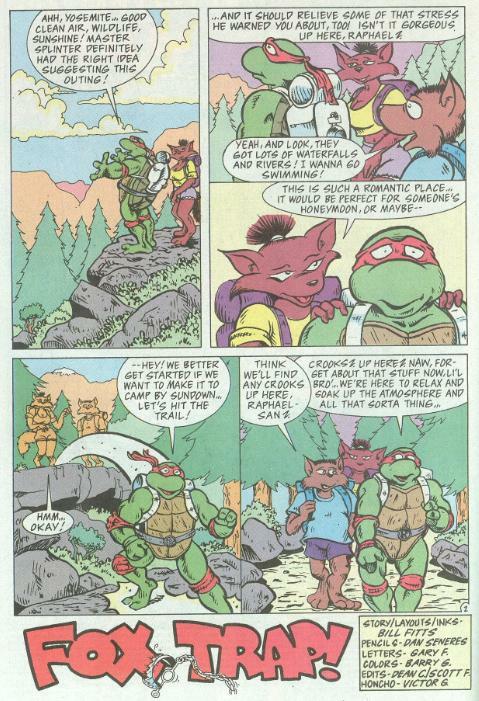 Nervously, Raph runs off to find a place to make camp. While stomping around, Raph finds a fox snared in a trap. Freeing the little guy, the trio is incensed at the prospect of poachers in a national park. They spot said poachers not far away: Lucienda Van Pelt, Queen of the Fur Trade, and her dimwitted son, Trapper Jon. The poachers have captured dozens of foxes and put them in a cage with designs on turning their hides into coats. Ninjara and Naga want to stop them, but Raph reminds them that they have to obey their sensei’s commands. They’ll make camp and notify the park rangers in the morning. As night falls and everyone goes to bed, Naga finds himself restless. He decides to sneak over to the cage and free the foxes without anyone noticing. Unfortunately, he’s careless and is caught in one of Trapper Jon’s snares. Lucienda begins coveting Naga’s coat, contemplating all the outfits and accessories she can make from it. The sun rises and Ninjara notices Naga missing. Waking Raph, she heads back to where they last spotted the poachers, knowing Naga must have gone there. The pair arrive just in time and trounce the two poachers. They then free Naga, set the foxes loose and truss the poachers up for the authorities. Back at the lair, Naga relates their adventure to the other Turtles and Splinter. Ninjara tells Raph that perhaps next time they go on vacation they should just try a motel. Raph moans that they’d have a better chance of finding peace and quiet on a desert island. *Naga last appeared in TMNT Adventures #46. He’ll appear again in “A Perfect Evening”. *Due to Naga’s presence and the break in the serialization of the ongoing, this story has to take place somewhere between TMNT Adventures #50 and TMNT Adventures #55. Personally, I just place it after TMNT Adventures #52. As the lead story in TMNT Adventures Special #10, I actually thought “Fox Trap!” had the potential to go on a lot longer. The concept of it is interesting; a story revolving strictly around Ninjara and Raph (and Naga), giving them time to get their romance on. Believe it or not, but ever since Ninjara and Raph hooked up way back in TMNT Adventures #31, they’ve hardly had any alone time in the book to develop their relationship. TMNT Adventures #46 was the probably the biggest “Ninjara/Raph story” in the series and they spent the whole thing fighting. At 8 pages, “Fox Trap!” isn’t much and I was left feeling we could have gotten more out of it. Anyway, it’s a decent little story. It’s cool to see Naga getting some page time, even if it’s just as the annoying little brother that screws everything up. We learn so little about Ninjara’s background and her family in TMNT Adventures that any material is welcome, no matter how brief or shallow. Lucienda and Trapper Jon aren’t particularly good villains, but I get the impression they weren’t meant to be. When it comes to Bill Fitts’s script, I guess I have a few issues. I mean, since when does Raph walk away not only from a fight, but from doing the right thing, just because Splinter told him to? 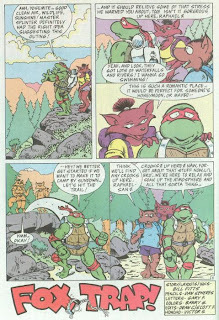 Even ignoring the fact that Raph is the “rebel” and blindly following their sensei’s orders is more of a Leo failing, I honestly do not think any of the Turtles would have interpreted Splinter’s orders as “see innocent animals getting skinned alive and do nothing about it until morning”. It just seemed wildly out of character for Raph. There’s also this one weird part on page 3 where Naga sniffs the air and then asks if Raph *hears* something. Wha? I like Dan Seneres’s art style, though he gives Ninjara a strangely wide cranium (and goes a little overboard on her anatomical proportions). The expressions are lively and he packs a lot of panels into 8 pages (though the layouts were done by Fitts, admittedly). Not much else to say about the art, really. TMNT Adventures Special #10 advertised itself as “the Raph and Ninjara issue”, but the two Raph and Ninjara stories are short comedy strips while the long-form adventure that goes on for 26 pages is a Ninjara-free story of wild west insanity. I honestly would have preferred it if the advertised Ninjara and Raph stories had gotten fleshed out more, as their romance never felt very well-developed and could have used all the help it could get. Come on Dr. Spengler, certainly if you're not bothered when you're Colleague Dr. Stantz asks "Listen, do you smell that?" then you can't be offended when Ninjara sniffs and then asks Raph if he hears something. Its the same basic act, in reverse. 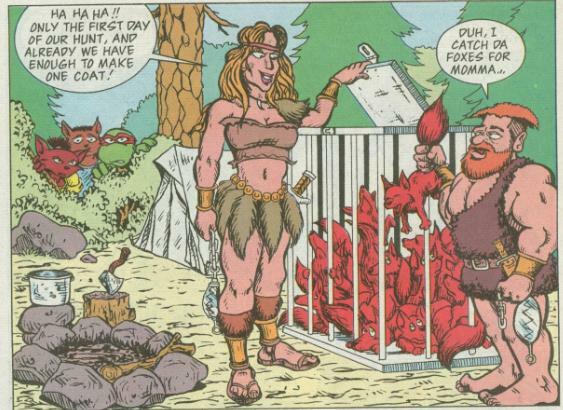 I agree 100% on the lack of romantic development of "Ninjaraph" the only moment that really hit me was when Splinter essentially gave her his blessing to date Raph in Issue 38. I too was disappointed when this issue really fail to deliver anymore.